Our latest Haikus with Hotties poet is the Taiwanese American piano prodigy turned American Ninja Warrior competitor Yen Chen. He recently joined an esteemed group of athletes on the hit NBC obstacle course competition show, based on the Japanese sports entertainment television special Sasuke. Chen first heard about Sasuke when an English-dubbed version of the show called Ninja Warrior was being broadcast in the U.S. on the now-defunct G4 channel. Producers announced they were making an American spin-off in 2009. An audition tape Chen filmed, where he made light of Asian American male stereotypes, went viral, and as a result, he got a shot at the course. Though he didn’t have an athletic background, he had previously taken up rock climbing to conquer his fear of heights, and his resulting grip strength now serves him well in difficult obstacles, including the Salmon Ladder, Giant Cycle and the Doorknob Arch. This year, Chen became one of only 18 finalists to make it to Stage 2 of the Las Vegas Finals at Mount Midoriyama — an impressive feat considering only 90 competitors from the multiple-city national tryouts made it to Vegas, and only two athletes made it to Stage 3, where they both fell. So the challenge to become the first American Ninja Warrior to complete the course still remains, and it could be Chen. So what does it take to tackle Mount Midoriyama while maintaining ultimate hotness? We seek answers through the ancient art of haiku. The author (right) and his sister, one awkward Halloween day. The other night, at a large outdoor Halloween-themed party, I saw a young white girl, probably about 3 or 4, dressed up in a long, purple kimono. I felt an involuntary uneasiness. I wanted to ask her parents who she was supposed to be — maybe it’s a character in some cartoon I don’t know about, I thought — but I didn’t want to embarrass anyone. Which is to say, Problematic Dress-up Season is in full swing. But what happens when the costume might be offensive to yourself? As I was trying to figure out what to be for Halloween this year, I had a recollection of my mom using eyebrow pencil to draw a Fu Manchu-style mustache on my face as part of a costume when I was a kid. (It’s probably worth noting here that I was adopted from Korea, and that my mom is white.) 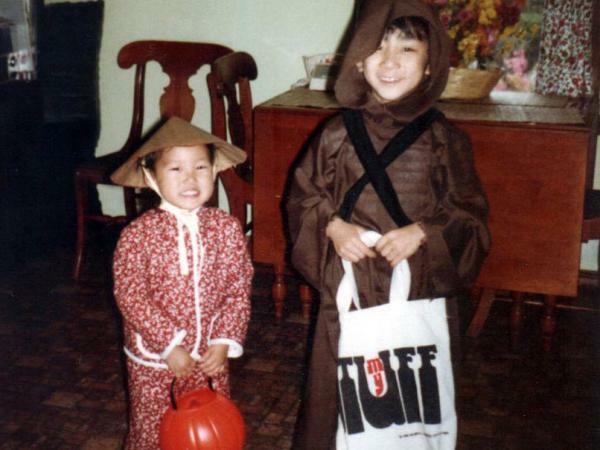 When I asked my parents about this, they said they didn’t remember that Halloween costume in particular, but they did remember once dressing up my sister, who’s also a Korean adoptee, “in a coolie hat,” which is how my mom phrased it. “What was she supposed to be?” I asked. “An Asian girl,” my mom replied. This recollection reminded me how, in my teens and early 20s, I made a conscious effort to carry over my Asian-American identity reclamation project onto my Halloween costume choices. That did not prove easy. If someone asked for a hint, I’d recite what lines of his I could remember from the movie — “Hey, lady, call him Dr. Jones!” — which of course required putting on an accent. Talk about problematic. Halloween is particularly tricky (so to speak) in that a costume’s success depends so much on what resonates within the culture, and when so much of what resonates derives from racist attitudes, the holiday becomes a crucible of identity struggles. One year I wore all black clothing, a black mask and black leather gloves. Most people recognized this as a costume — one person who was probably quite drunk guessed Zorro — but no one guessed who it was supposed to be: Kato, the Green Hornet’s sidekick and Bruce Lee’s first American television role. If you’re sensing a theme of “Asian” and “sidekick,” then you have stayed woke, as it were. The larger issue in all this is that it was near impossible to choose a costume that was Asian-American, and just as hard to choose one that was Asian without perpetuating the kinds of stereotypes I spent the other 364 days a year trying to dispel. I love Bruce Lee, obviously, but I would never wear a gi for Halloween. (If I wore his yellow-and-black jumpsuit from The Game of Death, folks might wonder why I thought I could pull off Uma Thurman.) And I’d never wear a traditional Korean hanbok, either — because while “person from another culture” is not a good costume idea, neither is “person from my own culture.” Both treat ethnic identity as a plaything. One year I considered going as Ah Jong, Chow Yun-fat‘s character in The Killer, but that mostly involved wearing a suit and holding two guns, which something told me would go over about as well as previous attempts. The options only got more obscure from there — I’m the guy from that movie Reservoir Dogs ripped off! — and I eventually gave up on the project altogether. Then again, maybe this year I’ll go as Ekelarc Yong. The online dating website “Are You Interested” recently surveyed more than 2.4 million interactions on its site and confirmed what many of us suspect: America loves Asian women. In fact, Asian female users are more likely to get messages, including inappropriate ones, from male users of any race other than Asian. This trend, popularly dubbed “yellow fever,” is not a new phenomenon, springing instead from an attraction to what some observers say is the exotic appeal of Asian women, and a self-indulging fantasy of being with women who are seen as docile and submissive. A 2007 study conducted by researchers at Columbia University, which surveyed a group of over 400 students who participated orchestrated “speed dating” sessions, showed that African-American and white women said “yes” 65% less often to the prospect of dating Asian men in comparison of men of their own race, while Hispanic women said yes 50% less frequently. Though Asian-Americans still date and marry each other, cultural stereotypes of Asian men may make them less attractive to women of all races, including Asians. Despite iconic masculine Asian role models like Bruce Lee, Asian men are often portrayed as scrawny males who spend more time studying than lifting weights in the gym, appearing in popular culture as soft-spoken, reserved types who rarely take part in activities that people qualify as “masculine” like professional football or construction work, as characters played for laughs. These depictions run counter to what society tells us women want: someone confident, tall, dark and handsome. Growing up, I felt the same way. Part of me believed that I had no chance with non-Asian women because our cultural differences were too apparent. The other part was simply a lack of self-confidence. I rarely had the courage to express my feelings because I was too worried about the what-ifs. Over time, I forced myself to look past the stigmas that defined Asian males and worked to counter them. It paid off slowly but surely. Even for those who share Ma’s confidence, the sad truth is that the media continues to perpetuate the emasculated Asian male stereotype. To some, we are quiet or asexual. To others, we’re less manly than our white, black and Hispanic counterparts. The consensus seems to be that Asian men have nothing going for them. “While growing up in a homogeneous white town, it was a standard perception that Asian men just weren’t attractive,” Sarah Shaw acknowledged in a post for Mapping Words earlier this year. Whether this line of thought will change depends on the media’s openness to promote more traditionally or differentially masculine Asian figures, and the willingness of Asian men to tackle existing media stereotypes of us head-on. 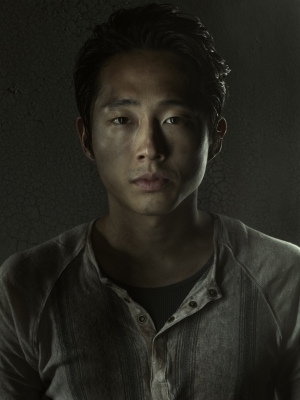 As long as characters like Short Round continue to exist, Asian males will always have to confront issues regarding their masculinity. The Broadway Musical “Miss Saigon” recently celebrated its 24th birthday and is gearing up to launch in Minneapolis and Detroit. But the play’s new run is giving some the chance to speak out. The musical, which was written by Claude-Michel Schönberg, Alain Boubil, and Richard Maltby, centers on a romance between an American man and a Vietnamese woman during the Vietnam War. Since its opening in 1989, the play has become one of the longest running and most enduring representations of Vietnamese people in the Western world. But many detractors accuse the play of trafficking in age-old Asian stereotypes. 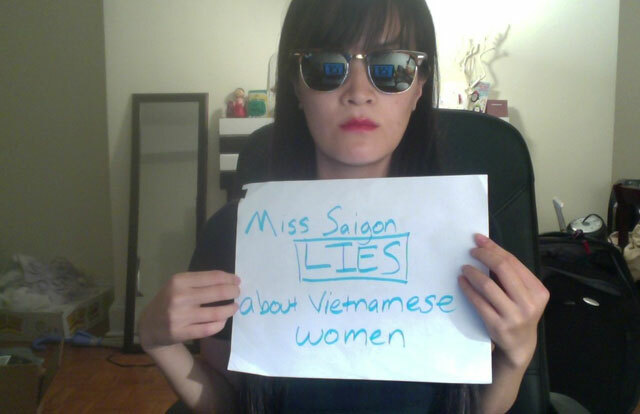 A new Tumblr campaign has popped up called Don’t Buy Miss Saigon: Our Truth Project. In it, dozens of Asian-Americans, most Vietnamese men and women, can “share their truths, as an act of resistance,” according to the website.